NIGHT/Plovdiv and “Common Future” NGO will present a two-day (or rather two-night) music festival format which will transform the Sahat hill into an open-air music stage. The first evening the program will be opened with a DJ set with music from the online radio based in Plovdiv – Xraydio. It is a project of Zack Kuzmanov (Jonny Fiasco), well-known internationally for being member of the groups Black Moses and Ultra Grand Supreme. The party will continue with Aki Vanderley (Sofia), known for his eclectic style of playing strange tracks from dirty 50s and 60s space edge pop, through Roma folk, African rock, to mutated disco and Japanese psychedelic. 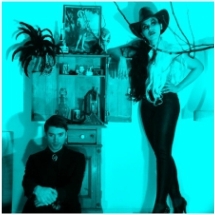 After the two sets the Berlin electro pop / art pop / noir Berlin based duo Noblesse Oblige. They combine electronics and acoustics in order to create a unique style of dance mystery, pop melodies and fine electronics with references to the disco and wave eras, all this garnished with acoustic and electric guitars which add the needed dose of rock. There will be Berlin presence at the second night as well. The program will then start with a DJ set by Purita D, also known as Rough Diamond. She started her career in 2001 in the Netherlands where she plays from vinyls at various parties – from illegal and underground techno parties to hip hop and Graffiti Jams. Next will be the experimental techno duo RoboKnob from Sofia. They just love machines and make endless interventions in their technical possibilities. The culmination of the program will be with Alavux who is among the leading artists at the electronic scene at the moment. He was born in Belgrade and is one of the pioneers of the electro sound from Eastern Europe. Alavux successfully combines electro, techno and unusual sounds in an entity which bares the marks of late 80s and early 90s classics in the genre. At the same time he responds with contemporary and open approach. Common Future NGO is an organization of young and crazy people, which was established with altruistic purpose and pursuing highly idealistic philosophy. To support non-commercial and independent art is a sanctum. Doing it in Bulgaria is like to be a keeper of The Beatles records in Alabama after John Lennon's joke about Jesus Christ.